SOAP and REST are the APIs(Application Programming Interface). First we need to know about API. API is an interface or a software intermediary that allows two applications to talk to each other. In general terms, it is a set of clearly defined methods of communication between various software components. Example : Imagine you’ve got a black box with a big red button on top. When you press the button, the black box lights up. In this example, the application is the box itself. The interface is the understanding between you and the box. In other words, it is an interface for programming the application (the box). The API, therefore, lets you know how to write out the commands to make the box do stuff. Every programming language can understand the XML markup language. Hence, XML was used as the underlying medium for data exchange. But there are no standard specifications on use of XML across all programming languages for data exchange. That is where SOAP comes in. SOAP stands for Simple Object Access Protocol. SOAP was designed to work with XML and have some sort of specification which could be used across all applications. Client-Server : This concept explains that the client and the server should be separate from each other and allowed to evolve individually. Stateless : REST APIs are stateless, meaning that it does not save history of any request or response. Once the request is sent by the client it closes the connection and establishes the new connection to give the response. Cache : Because a stateless API can increase request overhead by handling large loads of incoming and outbound calls, because for each request and response it creates a new connection, a REST API should be designed to encourage the storage of cacheable data. Uniform Interface : The key to separate the client from server is having a uniform interface that allows independent evolution of the application without having the application’s services, or models and actions, tightly coupled to the API layer itself. Layered System : REST APIs have different layers of their architecture working together to build a hierarchy that helps create a more scalable and modular application. Code on Demand : Code on Demand allows for code or applets to be transmitted via the API for use within the application . 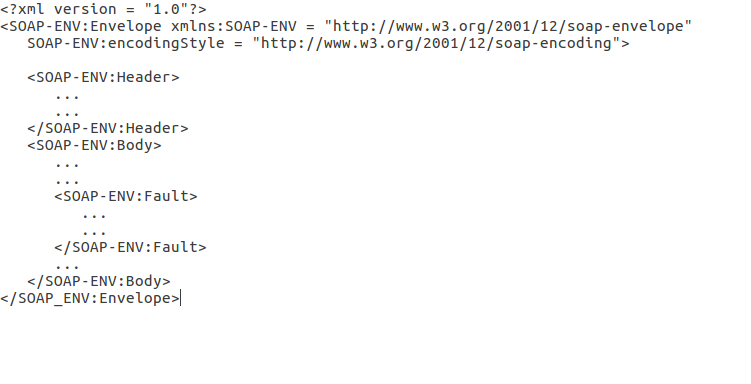 SOAP uses WSDL (Web Service Descriptive Language) for data validation. It validates the data with WSDL then proceed for the data transfer else it gives the error message and terminates the data transfer process. Envelope : As it’s name indicates it envelopes the SOAP message, that means it is a starting and ending tag. Header : It contains the attributes used in processing the message. Body : It is a message part of the SOAP request. Fault : An optional Fault element that provides information about errors that occur while processing the message. Refer the image for SOAP request. POST : POST Request to create a new user. GET : GET request to get the existing users. PUT : PUT request to update the details of existing user. DELETE : DELETE request to delete an existing user. REST API is the stateless protocol that does not maintain the record of any transaction , from the security point of view it is not good to use REST for confidential data sharing. SOAP provides the secure connection to the server for sending request and receiving response. SOAP follows the ACID property that ensures the data should not be alter in between the transaction. REST does not follow any of the standard to maintain data manipulation. ACID property stands for Atomicity , Consistency , Isolation , Durability. Atomicity : Atomicity guarantees that each transaction is treated as a single “unit”, which either succeeds completely, or fails completely. Consistency :Consistency ensures that the data should be validated with the predefined rules. Isolation : Isolation ensures that concurrent execution of transactions does not affect by other transactions . Durability : Durability guarantees that once a transaction has been committed, it will remain committed even in the case of a system failure. REST process the data faster than the SOAP API, as it uses JSON data format whereas SOAP uses XML format for data. SOAP cannot use REST because it is a protocol whereas REST can use SOAP web services because it is a concept and can use any protocol like HTTP, SOAP. SOAP recommended for the areas where we need high security : enterprise apps, high-security apps, distributed environment, financial services, payment gateways, telecommunication services whereas REST recommended for the areas where we do not need security :public APIs for web services, mobile services, social networks. Let us know in below comment box . You can also drop a mail at support@webkul.com .